will cause the ice-rich soil to liquify, and liquid soil has little strength and will settle or subside. wreaks havoc on the drivability of the road surface by creating undulations and cracking." 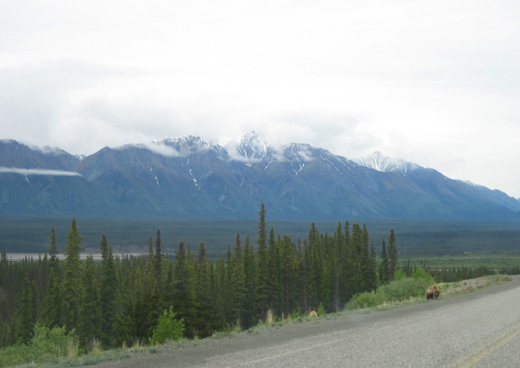 This is the last of several entries about our memorable journey through the southwestern part of the Yukon Territory on the Alaska Highway. It was foggy when we left the Congdon Creek Provincial Park campground this morning. 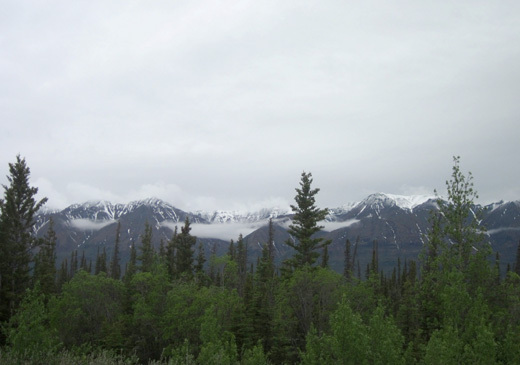 The temperature was quite chilly, in the low 40s F.
Clouds and sporadic light rain hung over the Kluane, St. Elias, Ruby, Nisling, and Nutzotin Mountain ranges as we continued traveling through the broad river valleys between these mountain ranges. We could see fresh snow up to the cloud level and on some of the peaks. As cold as it's been the last couple of days it has probably been snowing on the mountains when we've had rain down below. 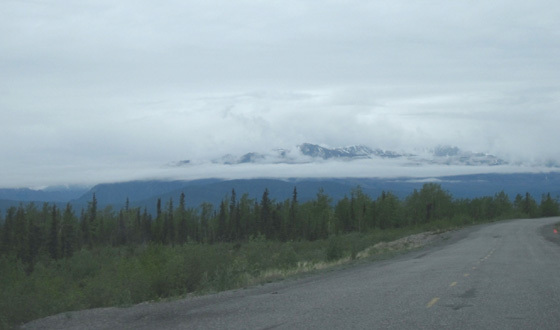 It was difficult to get any good photos of the Kluane and St. Elias Ranges from my side of the truck; they were on Jim's side this morning and he was busy driving. This is reportedly a good place to observe grizzly bears and bald eagles when the chum salmon swim up the river to spawn in this area in August and September. 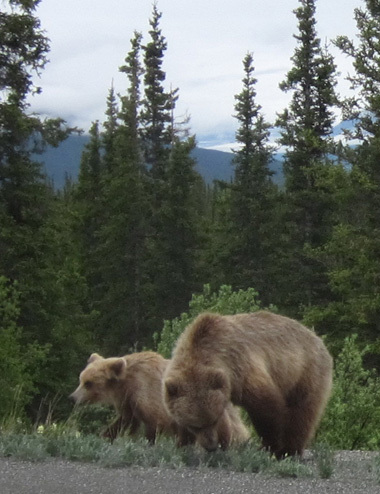 Bears and eagles love to eat salmon. 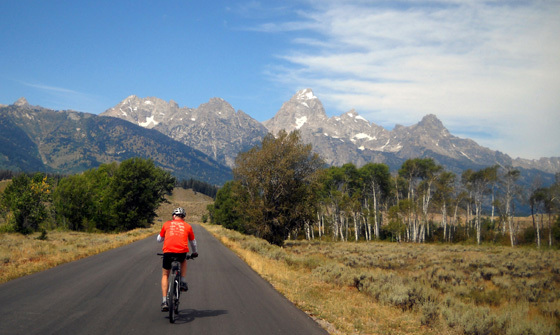 We'll have to remember to stop at this wayside again on our way back to the Lower 48 and maybe we can see some action. 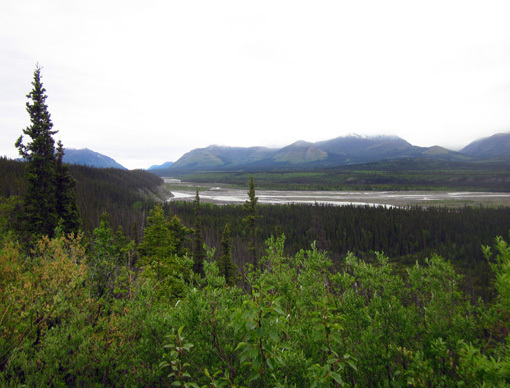 This is one of several broad river valleys in the Yukon. They are all rich in biological resources that have sustained both Native Peoples and wildlife for thousands of years. For countless generations the land and water in this valley have provided their gifts of fish, birds, and big game to the people of the Kluane First Nation. It was a time of harmonious co-existence. During the short summer season, the vast northern forest came alive to the sound of songbirds and the piercing call of gulls, hawks, and eagles. The woods provided shelter for the silent passage of moose, caribou, bear, and other animals. In sheltered mountain valleys, small community settlements were built along important waterways near abundant sources of wild game, fish, and waterfowl staging areas. These settlements of log structures were a winter refuge for our nomadic ancestors. 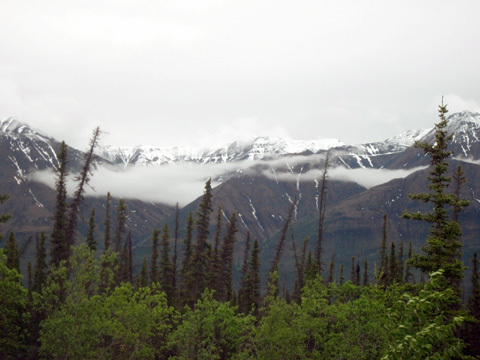 The Kluane First Nation has since adopted modern technology but continues to use the land and water around you for the necessities of life: food, water, medicine, tools, shelter, and clothing. We work together to preserve our culture and heritage and to ensure that our resources and environment remain in the pristine state our ancestors entrusted us with. 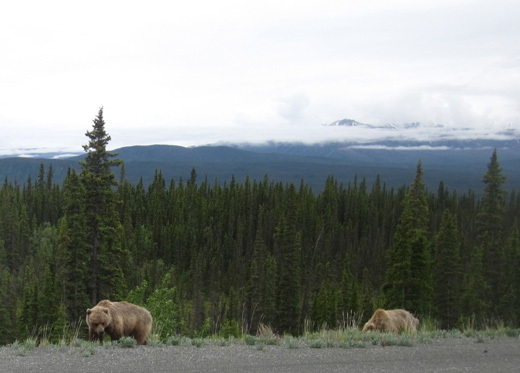 It was still too cloudy to get a good view of the mountains but look what Jim spotted on his side of the road -- two grizzlies grazing right next to the shoulder! 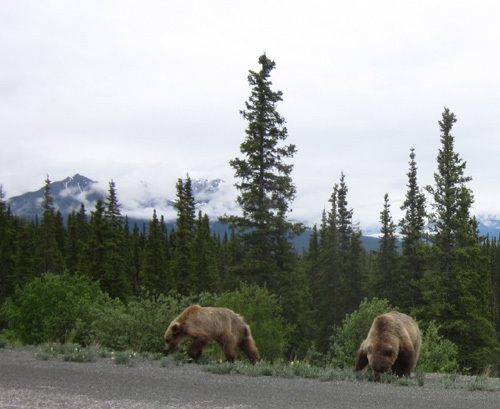 He could see that no one was coming behind us (still very little traffic today until we got into Alaska) so he pulled over and stopped on the right side of the road to take more pictures of the bears. 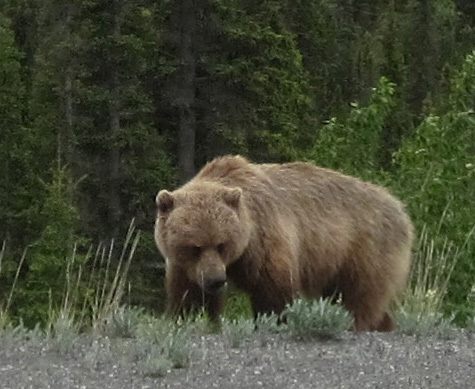 The grizzlies completely ignored us -- and Cody's growling; he knew they were there. As we continued north we flashed a trio of approaching motorcyclists to warn them about the bears. That could be a risky way to travel through the Yukon, but not as risky as the few bicycles we've seen. We could see large white trumpeter swans sitting on their nests on little grassy islands on some of the lakes and ponds. 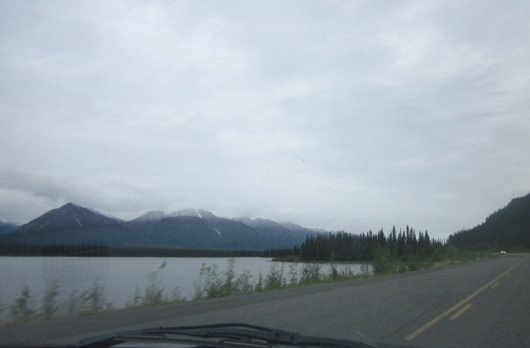 We've read in Milepost, the Church's book (Alaskan Camping), and numerous RVers' blogs that the very worst part of the Alaskan Highway is from Destruction Bay to the YT/AK border, a distance of about 136 miles. Some expand the problem area to the last 200 miles in the Yukon Territory. Not only are the road conditions reputed to be more primitive here, it's also where many RVers get windshield and other damage to their vehicles from rocks thrown up by faster vehicles -- especially big trucks barreling down the highway. Since Destruction Bay was just a few miles north of our campground we were on high alert this morning for frost heaves, wavy pavement, potholes, gravel breaks in the pavement . . . and big, fast trucks! I can report that the road was pretty poor in some places but our experience wasn't nearly as bad as I expected. note the large culverts (L) on either side of the big bulldozer. This section of the Alaska Hwy. has basically been "under construction" since it was first built hastily in 1942. 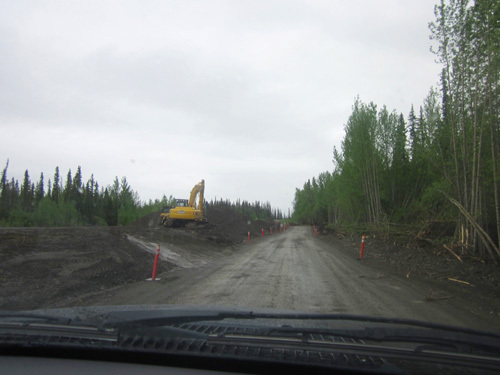 The problem is permafrost, which causes continual challenges for road crews in the Yukon and Alaska. Milepost has a good description of the concerted efforts by U.S. and Canadian engineers to outwit Mother Nature. Current techniques include vents under the highway to prevent the frozen ground from thawing during the summer. It's the thawing that causes the bed under the road to heave and/or crumble. The better they can keep it frozen, the fewer problems will result. 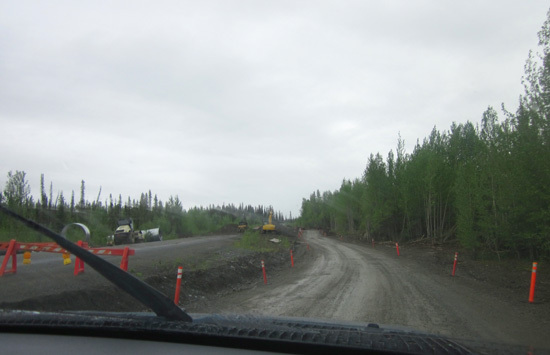 Since this part of the highway is used more by Alaskans than Canadians, the U.S. has agreed to cover some portion of the maintenance costs in this section. That's reasonable. We had to drive 20-30 MPH in some areas. In others, we could go 40-50 MPH. It was intense the whole way, however, because we had to be alert for upcoming wavy sections and potholes. You notice those more in an RV than in a passenger vehicle. Fortunately, the gravel breaks were marked with orange flagging or signs. This dirt detour was smoother than some paved sections today. Thank goodness there was minimal traffic on this section this morning. Really minimal. This is a pretty desolate place. We met an oncoming semi on one section of gravel and worried about windshield damage to our truck. Fortunately, the truck was going about as slow as Jim. We saw only two crews working on the gravel breaks between Destruction Bay and the border today. The highway department is still in damage-control mode with last week's washouts and mudslides all other the province. The detour in the photos above allows traffic to go around one of last week's washouts so the crew can fix the highway without any traffic on it. Hopefully the two huge culverts waiting to be installed there will prevent this kind of damage during the next flood event. 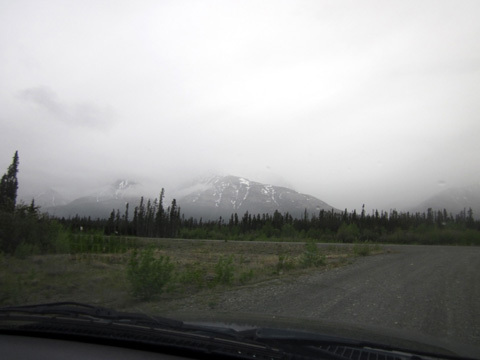 We hoped that the highway would be better through the first 90 miles in Alaska. (It goes farther, but we're heading south on the Glenn Hwy. from Tok.) See the next entry for conditions on the way to Tok. The last little town in the Yukon going northbound on the Alaska Hwy. is Beaver Creek, where we got a few liters of diesel to ensure we didn't run out before reaching Tok. We're also carrying an extra five gallons of emergency fuel in remote areas. 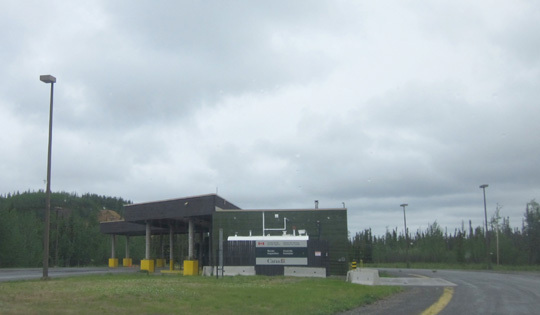 The Canadian border station is just west of Beaver Creek, approximately 18 miles inside Canada. That surprised us because the Canadian and U.S. border stations in Montana were adjacent to each other and right on the border. Since there aren't any other roads in this area for someone to use to sneak into the country I guess it really doesn't matter. Northbound traffic to Alaska simply goes around to the right. We waved bye-bye and continued north. We'll most likely be re-entering Canada at this point in the fall unless we get a wild hair and go north from Tok to Chicken, AK (don't you just love that name?) and come down the Top of the World and Klondike Highways to Whitehorse. If the weather is nice I'd rather return past Kluane Lake so we can see what these mountains look like when they aren't obscured by clouds. Pretty soon we saw a big sign welcoming us to Alaska! That was a special moment for us. We were much more nonchalant about the border crossing into Alaska today than we were a couple weeks ago entering Canada. What will be, will be. 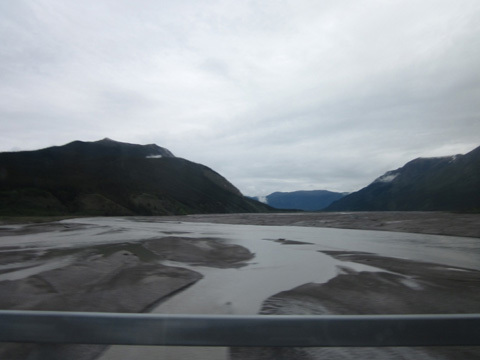 Next entry: over the border and finally in Alaska; now what?